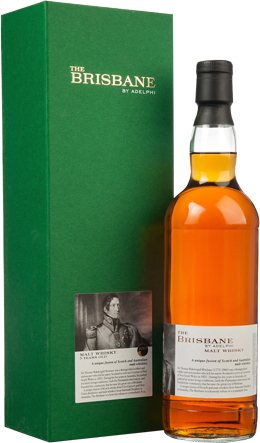 The Brisbane is the fourth in the series of iconic blends from Fusion Whisky and Adelphi, created in honour of the Scottish soldier and astronomer, Thomas Makdougall Brisbane. Born near Largs in Scotland in 1773, Thomas Brisbane was a distinguished officer in the British Army, and served as Governor of New South Wales from 1821-25. As well as the city that bears his name, Brisbane opened the door to the foundation of Melbourne, enabled a free press, and worked to improve conditions for colonists and secure compensation for Aboriginals who lost land. A great pioneer of astronomy, he also built the country’s second observatory, and instigated the first astronomical survey of the southern hemisphere skies, for which the Sir Thomas Brisbane Planetarium is named after him. Brisbane also built Scotland’s second permanent observatory and was a great patron of science. A crater on the Moon bears his name. A unique fusion of Scotch malt whisky from Glen Grant and Glen Garioch distilleries and malt whisky from Starward Distillery in Melbourne, Australia, The Brisbane is a heavenly tribute to a remarkable Scot. Only 932 bottles of The Brisbane were produced. Sir Thomas Makdougall Brisbane was a distinguished British soldier, but it is for his scientific achievements, and the great Australian city, for which he is best remembered. Brisbane was born into a noble family in Ayrshire in Scotland’s west coast in 1773, and educated at the University of Edinburgh and the English Academy in London where he nurtured a lifelong passion for mathematics and astronomy. Aged 16 years old, he followed in his father’s footsteps and joined the British Army, taking up a commission as an Ensign in the 38th Regiment of Foot. For the next 25 years, Brisbane cross-crossed Europe and the Atlantic Ocean as he served in Spain, France and Flanders, the West Indies and North America, earning battle scars and medals, and rising though the ranks with each new posting: Lieutenant, Captain, Colonel, then Major-General. In 1821 he replaced fellow Scot Lachlan Macquarie as Governor of New South Wales, his wife Anna Marie and young daughter Isabella joining him on the long voyage to Australia. The next four years were challenging for Brisbane, however. Personal rivalries, political tensions and poor communications hampered his authority. Yet Brisbane achieved much. He pushed land reform, reduced corporal punishment, sought religious tolerance, helped emancipate convicts, secured settlements for Aboriginals, introduced trial by jury, encouraged an open press, and co-founded the Philosophical Society of Australasia, now the Royal Society of New South Wales. And he opened, at his own significant expense, the Parramatta Observatory, near Sydney. Its work was a pioneering catalogue of 7385 stars that became the foundation for astronomy in Australia. Brisbane also ordered the further exploration of the east coast, establishing a new convict settlement there. Over time this community grew and prospered, shaking off the shackles of its penal past. In 1834 it was named Brisbane in honour of the man who founded it. 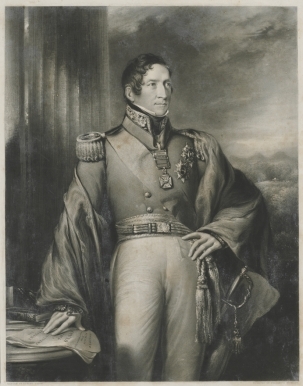 Achievements, titles and military decorations continued to follow Brisbane upon his return to Britain in 1826. He built another observatory in Scotland, and remained a generous patron of science. He became President of the Edinburgh Astronomical Institution, and in 1832 succeeded the great novelist Sir Walter Scott as President of the Royal Society of Edinburgh. He also received a prestigious goldmedal by the Royal Astronomical Society, was made a Knights Companion of the Order of the Bath, and given a baronetcy. By the time he was 85, he was said to be the oldest officer in the British Army. He died, two years later, aged 87.